Eastern National service 241 in 1965. Buses began operating services in the Basildon area as long ago as the early 1900s. Transport then was horse drawn, but from around the 1920s onwards motor vehicles took over when, among others Fred Hinton of Laindon, operating as Hinton's Laindon & District Motor Services, ran a double decker open top bus from Laindon Station to Wash Road. A company run by Tom Webster, Old Tom Motor Services, also operated services in Laindon, while in Pitsea a family called Campbell established a business which would later be acquired by Eastern National. Between the mid 1930s to the mid 1950s the Brentwood based City Coach Company ran numbered local bus routes as well as providing services to Ongar, Brentwood, Billericay and Wickford. 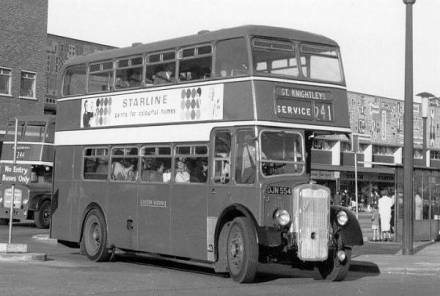 The first locally operated services by Eastern National Omnibus Company occurred in 1954 when a service to serve the new developments in Whitmore Way commenced. Eastern National's first bus garage was in Bull Road (now Clay Hill Road) Vange, having opened in 1951, but this proved too small and a new garage for 70 buses was constructed in Cherrydown (now Cherrydown East) at the junction with Clay Hill Road. Work began in 1960 and the garage was formally opened in April 1961. At the same time the Vange depot was closed and demolished to make way for a new regional neighbourhood shopping centre. Eastern National were in operation in the Basildon district until the early 1990s when local services were deregulated. Bus services in Basildon are now operated by First Thamesway, Crown, Jackson's and Wickford based company NIBS (Nelson's Independent Bus Services). Text researched and written 2001 with revisions 2002-2007. Copyright © 2001-2007, Basildon History Online. All rights reserved.